For a group that surfaced in 1987, Swing Out Sister have never taken much time off. You would discover -- going through their discography -- that they've been pumping out albums every two to three years...until now. Four years after Where Our Love Grows, Swing Out Sister have created their 9th studio album, Beautiful Mess, due out in U.K. stores on Sept. 8th. The disc grabs your attention early with the teasing and tantalizing groove of the first single "Something Every Day." Right there is ample evidence that Corinne Drewery and Andy Connell aren't falling back on their previous successes. "Time Tracks You Down" is lyrically astute and songbird Drewery gets to stretch her wings on some notes here. Expected as a possible single, "Butterfly," is beautiful and percussion-heavy but repeat listenings wear out the wings. A slight bit more experimentation surfaces in the textures used on "My State Of Mind" but seems to overpower the track. Close your eyes and you can't help but think Motown when hearing the electric "I'd Be Happy" which is a true gem here. "Butterfly Lullaby" (an instrumental interpretation of "Butterfly") is aptly titled and not recommended on long drives but maybe slow dancing. Lush build-up going into "Secret Love (You're Invisible)" as it utilizes the lull created by the former track and makes an abrupt but welcomed jump. Would just love to hear that remixed for the dance floor. "All I Say, All I Do" falls flat a little while "Out There" recaptures the torch with a stark keyboard opening, lightening as the layers build. The title track re-energizes the set as the disc closes. I can't recommend the Little Wizard bonus remixes of "Butterfly" and "Something Every Day" as they just don't add anything positive to the originals. I specifically recall my father referring to Sade as 'sleepy music' yet, entirely enjoying Anita Baker. Jazz in it's many variations has a wide range of reactions upon a listener. 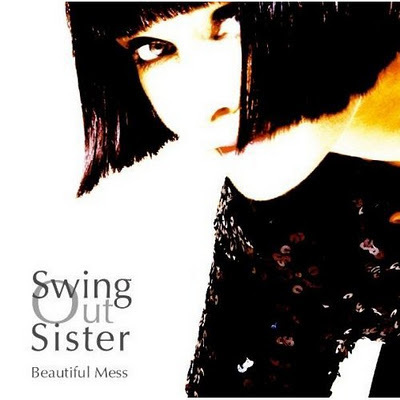 Technically, Swing Out Sister's Beautiful Mess hits all the right notes for this reviewer but I believe it repeats a few of them too often. Far from a mess, the album still shines more than not and fans will receive it with open arms. Every once in awhile I like to post a little about some restaurants here in town. Today, I wanted to tell you about my favorite place for pizza in Las Vegas. You see, for the longest time, I believed it was Aurelio's (located on Buffalo and Cheyenne.) Great stuff but a co-worker told me about Grimaldi's (9595 S. Eastern). I dismissed it entirely. A few months later he had told me how he came to believe it was the best pizza in town. He went to all the local places to try their food, took notes and rated them according to specific criteria. I never saw the notebook but decided that if he really did his research, I had to give it a try. A few months ago, I took Kerry and David there as we had to go next door to fill out some insurance information. The detour was a good thing. The pizza was terrific and Kerry likes the caesar salad there (which isn't normal unless it's wrapped up with some chicken.) Anyhow, I had some free time with her today and she's been craving pizza. So we went. David may be upset. He was off horseback riding with my Mom. But, we saved two slices for him. If we are sharing our leftovers with him, we might as well share the word about Grimaldi's with you. It's been busy and I wanted to at least post something before the week is up. Previously, I mentioned appearing on TWiT with Leo and Amber. It was pretty cool how, something set up like it is in the photo above, looked like it was done in a studio. They were surrounded by these chairs, some lighting and a producer's booth to the far side. Anyhow, someone attending took this photo during the show (I'm in the red shirt with black sleeves kinda in the middle) and shared it with some of the attendees so... why not share it with you. One thing that I did get from the whole convention was the need to improve my level of contact my 'community.' One step in that direction was setting up the Facebook account. I always figured that having one on MySpace was enough but, logically, there are probably people that feel the same way at Facebook. I was pretty astonished to see how many of you were already there. Lastly, I have a little bit of work ahead of me here as the new Swing Out Sister album, Beautiful Mess, and the Bureau's ...And Another Thing arrived yesterday. Reviews are an odd part of running 80s Music Central. It's how I started in music journalism at my high school newspaper. I remember cranking out opinion pieces on Nine Inch Nails' Pretty Hate Machine, the B-52's Cosmic Thing, Bell Biv Devoe's Poison, the Thompson Twins' Big Trash and many others. Who would have thought that I'd still be doing that nearly 20 years later. I guess, the highlight of my reviews was when I was contacted in 2002 by some band reps that were trying to push for the release of another single from Def Leppard's X album and wished to use my review as fuel to make it happen. Maybe I better get started on these new ones. Fans of Deep Purple and Rainbow may have had questions as to the disappearance of guitarist Ritchie Blackmore. In 1997, he went into the night... Blackmore's Night and hasn't returned. But what exactly is a return, anyhow, as it seems he's having fun there releasing 6 albums together up to now. Led by singer/songwriter Candice Night, the band have released their seventh disc, Secret Voyage. Rock, blues and country are an odd lot as they owe a lot to what has come before and even more to cross-pollination. New age music owes a lot to jazz and most music goes back to the days of the traveling minstrel. That is where Blackmore's Night come along and blur some lines between the Renaissance, Greek, rock and pop. The disc begins with a setting provided by the instrumental piece "God Save The Keg." Swept away into expecting much of the same, it is followed by the spellbinding "Locked Within The Crystal Ball." The tantalizing track is a harmonics dynamo built with waves of guitar virtuosity, mesmerizing vocals and a war drum rhythm section keeping the beat. Easy to get dizzy trying to count the instruments used on this outstanding song. It's hard to follow a lead like that but the subdued "Guided Cage" is mystery and beauty wrapped in strings... violin and flamenco. There are moments where you can hear flashes of Kate Bush, Celine Dion and even Sarah Brightman on these tracks. "Rainbow Eyes" is one of those moments and the pairing of this voice and guitar is spectacular. Other strong tracks here include "The Circle," "Sister Gypsy" and "Far And Away." The group does reach another crest with their cover of "Can't Help Falling In Love" (which even out-paces Lick The Tins 1987 version from the Some Kind Of Wonderful soundtrack.) The album closes with the lush "Empty Words" which eerily reconstitutes the refrain used in the album-opener "God Save The Keg." Secret Voyage is truly a journey into musical forms we don't hear expressed often enough. 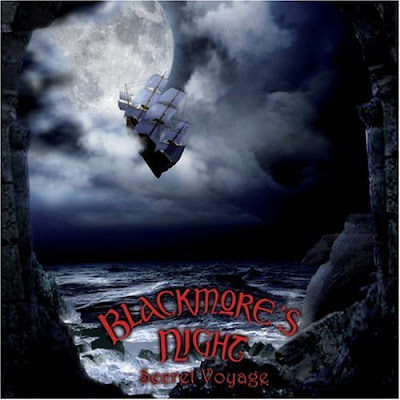 Some styles do get incorporated into other media forms in light doses but Blackmore's Night has a talent for bringing these themes and sounds from ages past into a context of now. Stellar production and performances here. Secret Voyage is the best kept secret out there... just don't tell them that we spilled the beans. A very quick post, as I gotta get some business cards printed up before work. I took a few days off to attend the New Media Expo (think of it as a podcasters convention.) Some great conference sessions are planned and I have to wiggle room in so I can still attend while doing the newsletter Friday and show on Saturday (the expo runs Thurs. to Sat.) They even have a hands-on audio editing conference that I'm going to that uses the same software (Audacity) that I use for the show. But, hands-on means: bring your laptop. I don't have one, nor really like them. 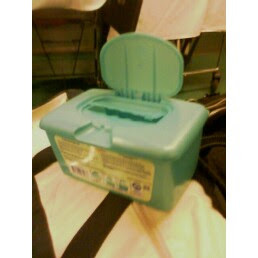 But thankfully, Kerry came up with a good idea of having me borrow one from someone for the day. I have to seriously thank them as well as Kerry's twin sister Kelly (yes, in Japan their names would sound alike) for watching David during Thursday and Friday. 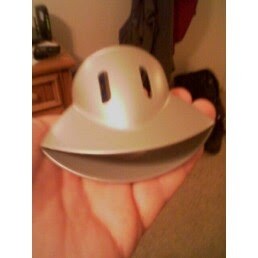 Anyhow... off to get business cards made... my printer is ticking me off. More about my issues with them in the future.